Silicon Valley, we have a problem! The 2016 election has made it all too clear that growing concerns some of us had about the failing promise of our new media were far more acute than we had imagined. Stuart Elliott recently observed that "...the only thing easier to find than fake news is discussion of the phenomenon of fake news." But as many have noted, this is a far bigger problem than just fake news (which is a reasonably tractable problem to solve). It is a problem of echo chambers and filter bubbles, and a still broader problem of critical thinking and responsible human relations. While the vision has been that new media could "augment human intellect," instead, it seems our media are "de-augmenting" our intellect. It is that deeper and more insidious problem that I focus on here. This post aims at putting that in the broader, and more currently urgent context. As one who has thought about electronic social media, and how to enhance collaborative intelligence, and the "wisdom"/"madness" of crowds since the 1970s, I thought it timely to post on this again, expand on its context, and again offer to collaborate with those seeking remedies. This post just touches on some issues that I hope to expand on in the future. This is a rich and complex challenge. Even perverse: as noted in my 2012 post, and again below, "balanced information may actually inflame extreme views." But at last there is a critical mass of people who realize this may be the most urgent problem in our Internet media world. Humanity may be on the road to self-destruction -- if we don't find a way to fix this fast. Some perspectives -- augmenting or de-augmenting? Around 1970 I was exposed to two seminal early digital media thinkers. Those looking to solve these problems today would do well to look back at this rich body of work. These problems are not new -- only newly critical. Doug Engelbart was a co-inventor of hypertext (the linking medium of the Web) and related tools, with the stated objective of "Augmenting Human Intellect." 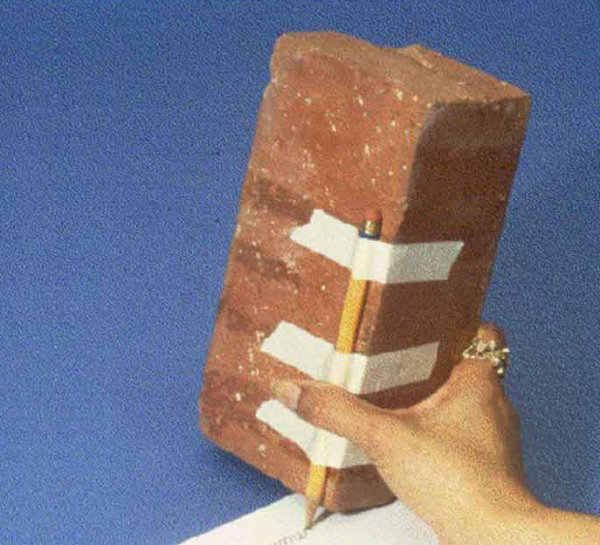 His classic tech report memorably illustrated the idea of augmenting how we use media, such as writing to help us think, in terms of the opposite -- we can de-augment the task of writing with a pencil by tying the pencil to a brick! While the Web and social media have done much to augment our thinking and discourse, we now see that they are also doing much to de-augment it. Murray Turoff did important early work on social decision support and collaborative problem solving systems. These systems were aimed as consensus-seeking (initially focused on defense and emergency preparedness), and included the Delphi technique, with its specific methods for balancing the loudest and most powerful voices. Not so long after that, I visited a lab at what is now Verizon, to see a researcher (Nathan Felde) working with an experimental super-high resolution screen for multimedia (10,000 by 10,000 pixels, as I recall -- that is more than 10 times richer than the 4K video that is just now becoming generally available). He observed that after working with that, going back to a then-conventional screen was like "eating dinner through a straw" -- de-augmentation again. Before the invention of writing, knowledge existed in the present tense between two or more people; when information was forgotten, it disappeared forever. That state of affairs created a special need for ideas that were easily memorized and repeatable (so, in a way, they could go viral). The immediacy of the oral world did not favor complicated, abstract ideas that need to be thought through. Instead, it elevated individuals who passed along memorable stories, wisdom and good news. And here we begin to see how the age of social media resembles the pre-literate, oral world. Facebook, Twitter, Snapchat and other platforms are fostering an emerging linguistic economy that places a high premium on ideas that are pithy, clear, memorable and repeatable (that is to say, viral). Complicated, nuanced thoughts that require context don’t play very well on most social platforms, but a resonant hashtag can have extraordinary influence. Mr. Trump is just the tip of the iceberg. Prepare for interesting times. Engelbart and Turoff (and others such as Ted Nelson, the other inventor of hypertext) pointed the way to doing the opposite -- we urgently need to re-focus on that vision, and extend it for this new age. One prominent call for change was by Tim O'Reilly, a very influential publisher, widely respected as a thought leader in Internet circles. He posted on "Media in the Age of Algorithms" and triggered much comment (including my comment referring to my 2012 post, which Tim recommended). Another prominent voice is Eli Pariser, who is known for his TED Talk and book on The Filter Bubble, a term he popularized in 2011. He recently created a collaborative Google Doc, which, as reported in Fortune," has become a hive of collaborative activity, with hundreds of journalists and other contributors brainstorming strategies for pushing back against publishers that peddle falsehoods" (I am one, contributing a section headed "Surprising Validators). The editable Doc is apparently generating so much traffic that a read-only copy has been posted! Shelly Palmer did a nice post this summer, "Your Comfort Zone May Destroy The World." We need to not just exhort stepping outside our comfort zones, which few will do unaided, but to make our media smart about enticing us to do that in easy and compelling ways. Balanced information may actually inflame extreme views -- that is the counter-intuitive suggestion in a NY Times op-ed by Cass Sunstein, "Breaking Up the Echo" (9/17/12). Sunstein is drawing on some very interesting research, and this points toward an important new direction for our media systems. I hope to continue to expand on this, and to work with others on these vital issues in the near future. One other critical aspect of this larger problem is citizen-support of serious journalism -- not chasing clicks or commercial sponsorship, but journalism for citizens. My other blog on FairPay addresses that need, most recently with this companion post: Panic in the Streets! Now People are Ready to Patron-ize Journalism! The Augmented Wisdom of Crowds: Rate the Raters and Weight the Ratings – details a broad architecture for where we should be going in social media (and digital democracy more broadly), more comprehensive and powerful than any I have seen. The Tao of Fake News – on the limits of experts, moderators, and rating agencies – and the need for augmented wisdom of the crowd as essential to maintaining our democratic/enlightenment values. 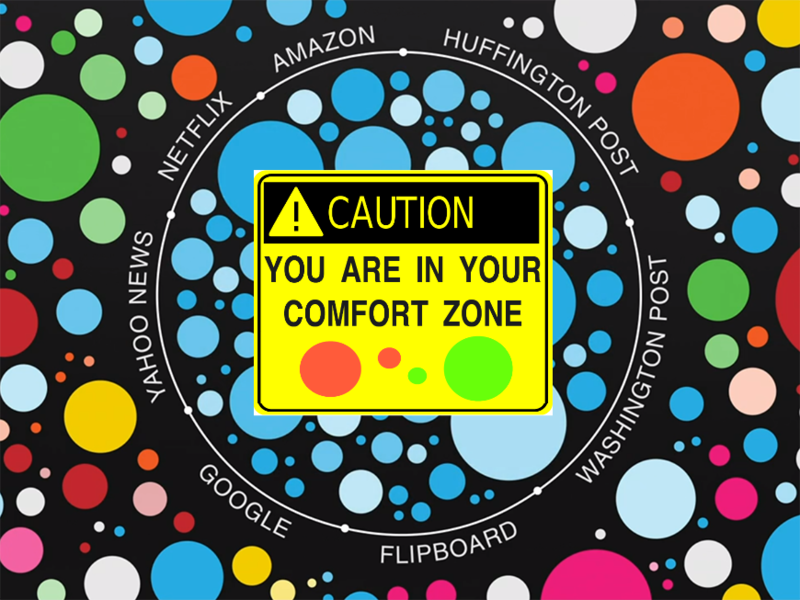 Filtering for Serendipity -- Extremism, 'Filter Bubbles' and 'Surprising Validators' – shows how this architecture addresses these specific concerns. An Open Letter to Influencers Concerned About Facebook and Other Platforms (and other posts that it refers to) – suggestions on business model incentives and regulation.